So, perhaps everyone should read Mein Kampf, as these men have recently determined. But who actually does? What perspective do these bring to the book? What do they buy alongside it? What did these people hope to learn? There are over six hundred reviews of Mein Kampf on Amazon, and I read all of them. Who gave it five stars? Three stars? Or just one? Hate them both or Love them both. What’s important is the realization that they came preaching the same message and suffered the same fate. Hitler didn’t wake up one day and hate the enemies of Germany. He saw problems with society and devoted his life in Vienna studying history and Marxism and relentlessly questioned the people behind the politics. He learned they were anti-German and transforming Germany/Austria into a multicultural state. While Knausgaard says he’s confident that nobody will be converted by reading the book, these sympathetic reviewers insist that it’s an eye opener: “I’ve read the entire book twice and i’m only 17. The idea’s and ‘ramblings’ as all you protalitariats call it would actually work. People should just give his book a chance in society today. It would be such a better place.” For Hitler’s converts, the “kosher biased media” is all that divides the enlightened from ordinary “sheeple.” Clarity lies in simply opening the book: “No wonder Europe is in the mess she’s in. No body reads anymore.” For these reviewers, the question tends not to be whether Hitler was right, but which is the right translation. The dangers of liberalism motivate many of these reviewers. Approximately two-thirds of all Amazon reviews of Mein Kampf have been published since Obama took office in 2009. I haven’t found evidence of a recent conservative call to read the book, but right-wing voices have been especially vocal in the reviews since the beginning of the year — right around the time that it was reported that Mein Kampf was an e-reader hit. One story noted that Mein Kampf’s place on the digital sales charts was surrounded by books from various conservative luminaries like Sarah Palin and Ben Carson. Some of the reviewers of this ilk not only insist that “national socialism” is the same as liberalism but also repeatedly assert, as one does, that “if Marx was not born as a Jew, Hitler would have bought into his economic plan.” One conservative is open about Hitler’s position on the extreme Right and annoyed by the intrusions of neo-Nazis into the Tea Party; this gets him branded a liberal. Hitler took over during a Depression too. Kinda reminds me of someone. Except Hitler tried to know everything going on in his administration. Everyone knew he was in charge, he was responsible in this respect, and not a part time leader. Hitler was a master propagandist, and Barack Obama is his socialist contemporary although he is too lazy. All Barack wants to do is play golf all day and basketball. In the United States the instant association of Hitler is linked to the white supremist movements, but the same philosophy is also present in the feminist movements, pro-abortion lobby, the compartmentilization of cultures in the differing diversity programs etc. Obama … has his “book” too. If Barack Obama had had the honesty to write what he really believed, instead of the vapid mush he put in his books, he never would have been elected President. I read this book to see if we are repeating history in any way at all. And YES we are. The one difference is that we now have a leader in America that has accellerated the pace of the Nazi’s. Hitler had his brown shirts where Obama has his purple shirts. Hitler had Gurbles vs Gibbs and Axelrod. Hitler had Himmler vs Rob Emmanuel and Andy Sterns. The parellels can go on and on. But what I found terrifying is that our president is moving at light speed in comparison while following a very simular road map. Dozens of reviewers use this line about history repeating. This one would surely like to be able to “go on and on” with supposed parallels, but it sure gets tricky. Hitler began killing disloyal elements within a year of taking power. In his fifth year in office, Kristallnacht happened. Surely, not all these conservative reviewers believe what they’re saying. Many of their reviews are the shortest and least detailed, suggesting that perhaps they didn’t read the book and simply see this forum as a useful place to perform their contempt of Obama. Hitler was not only spot-on but scathingly hilarious … when describing the shortcomings of the conservative politicians of his day and their tragicomic actions in the face of the communist/liberal threat. The GOP would do well to learn from this view of propaganda. Leave out the rants about the Jews though! Yet conservatives are not alone in finding things to agree with in Hitler’s tome. One reviewer writes, “Taking most of the statements and conclusions from this book and displaying them separately you would be surprised as to how many you would agree with.” Another says, “I will admit I agree with Hitler … but damn its hard to disagree with Hitler when it comes to social and governmental issues.” One describes this feeling as “psychologically torturing.” For some, this feeling is a reason to read the book: Maybe you ought to confront your own capacity to be Hitler. you owe it to yourself to read the book and experience this worldview as well, because only then can you hope to have the complete story. These reviewers are reasonably skeptical of mainstream forums, which, as the reviewers’ grammar sometimes indicates, rarely include their voices. Like so much bad news coverage, these reviewers start from a laudable goal of seeking differences of opinion and reduce it to a matter of weights and measures. Whereas journalism’s parameters of acceptable opinion are rather narrow, however, these reviewers expand the range of valid opinions all the way to Hitler. The man and his book thus continually earn hollow journalistic epithets like “controversial” and “polarizing,” as though Hitler’s depravity is still up for debate. Speaking in these terms of meta-analysis, that opprobrium is elided; maybe some even slyly use this approach to work Hitler back into the realm of acceptable thought. One reviewer writes that although Hitler did good for Germany, “he did harm to the rest of the people he thought as inferior. On the net of things, the oppinions tilt to more harm than good although some disagree.” (“3 of 4 people think this post adds to the discussion. Do you?”) This is not disinterested, academic inquiry, since no truth is sought; it’s just a purposeful way to shut one’s eyes. The book may be boring, but it was the cause of the death of 70+ million people. Big impact. If nothing else could be learned from this book, learn that 1 person has the God given ability to touch the future, whether he be a force for good or evil. Don’t admire Adolf Hitler for what he did when he came to power, admire him for being a single man who may have risen higher and impacted more than anyone in this century. You don’t have to agree with all his thoughts but respectfully he is the only leader to get that many faithful supporters besides Jesus. Again and again, reviewers praise Hitler as “one of the most powerful men in history,” or “the greatest mover in history.” He was a “man of strong principles, discipline and good organizational skills,” and overcame poverty “to create the worlds largest empire.” Try to set aside your negative feelings for a moment and appreciate the impact: “Greatness is not measured by good or evil. Greatness is. Fascist or not, Hitler was a great leader.” The praise is qualified, but the tribute paid to morality often feels trivial alongside the esteem. Hitler “did some bad things,” one of the above says. Although he “crossed that line and spiraled into madness” and “evil,” says another, he was “wonderful leader.” Few leaders, offers another, have “matched the depth of his dedication, evil though it was.” They see that he’s a “monster” just like many of the other reviewers; they just don’t think it’s worth dwelling on instead of the positive takeaways. The critical approaches that open up space for this esteem strike me as worse than the earlier Hitler comparisons. These more accepted modes of commentary — balance, meta-analysis, impact — affirm fundamentally nothing. And at their worst, they give cover to all manner of vileness, even that of Hitler and his acolytes. Through the meta-analysis, the Nazi can hide his affinities; through balance, he can hedge atrocities; through the Great Man approach, he can bury questions of ethics in esteem for leadership. Thus, although I tried to separate out Hitler’s committed admirers, it was often difficult. A review that would start as an ill-considered but honest attempt at impartiality would sometimes shade into sounding more like a way of working Hitler back into the realm of acceptable opinion. White nationalist reviewers even occasionally discuss the best strategy to avoid “alienating mainstream Whites.” Through these empty critical approaches — which have no less currency in politer forums — they have the tools to do so. It’s some consolation that many of the reviewers feel a healthy shame about owning the book. One reviewer speaks of “how much bull I have recieved for just haviiing it, especially from my jewish aquaintances.” Another says he has decided the most “fitting place is in the back of [his] garage.” “Read it in private,” one advises. True, not all are embarrassed. One reviewer laments that his copy is not “nearly as cool looking as” advertised. But another notes that the “very prominent picture of Hitler” and big, gold-lettered title on his cover “can’t be removed,” which may upset “hypersensitive folks.” Even a digital version reader makes it clear he will delete it when he’s done. This contempt is a nice antidote to all the fawning, and it’s probably more valid. 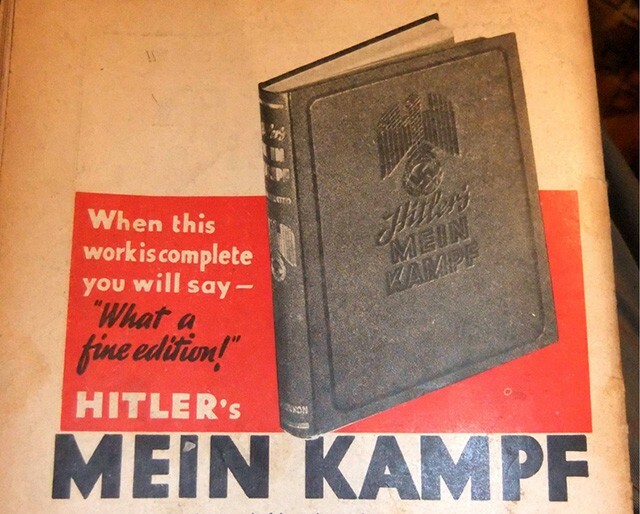 One of many reviews making a solid case for reading Mein Kampf also pointed me toward Ian Kershaw’s book The Hitler Myth, which demonstrates that Hitler certainly had his vile talents, but he was also plugged into an ongoing messianic call for a leader. The source of Hitler’s mystique was less the man than the propaganda machinery around him and the people eager to consume it. He was not interchangeable, but he was also “a projection of national aspirations to greatness.” His power “depended on the readiness of others to see ‘heroic’ qualities in him.” It’s apparent we’re still ready to see those qualities in Hitler today. We still have a lot to do with him. Full disclosure: I did not read Mein Kampf. Because it’s by Hitler. Andrew Heisel is a writer living in New Haven.